Growers need seed treated quickly, accurately and to order. At the Farm Progress Show on Tuesday, Bayer CropScience introduced On Demand, a closed treatment system, to meet that need. Treating seed for row crop production once required early ordering and a long wait. Not a system that works when weather delays planting until a farmer has to change crops to avoid a fallow field. 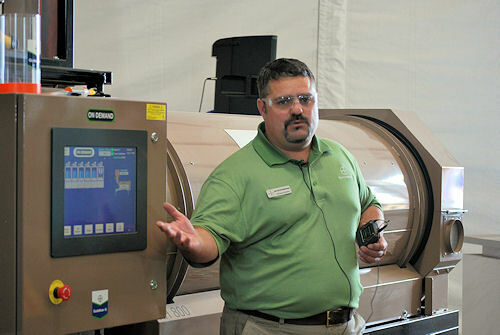 That became an old story when Bayer CropScience introduced a state-of-the-art seed treatment machine at the Farm Progress Show in Decatur, Ill., on Tuesday. Growers now can get seed treated On Demand. CONTAINMENT SETUP: The closed On Demand system improves safety for the operator and decreases risk to the environment, points out Jaco Van Der Westhuizen, strategic equipment marketing lead for Bayer equipment. Growers benefit from getting seed that’s treated quickly, accurately and to their specifications, says Bayer CropScience product manager Keith Vodrazka. “If the seed treater can treat faster, he can make that seed available sooner,” Vodrazka says. “Growers also can have a greater level of confidence in the rate that’s applied and the coverage.” The confidence is spurred by a system-generated printed report that lists the variety of seed, the treatment applied, the rate of product, when it was treated and by whom. A grower who melds that report with a yield report at the end of the season can tweak his system based on what worked where in his fields, Vodrazka points out. “Just like in your combine, you can combine the data with the results and see what worked and what didn’t,” says Jaco Van Der Westhuizen, strategic equipment marketing lead for Bayer equipment. Seed also can be treated in small batches, which allows growers to custom order for various fields. For instance, one field may need a double dose of nematicide because it’s under heavy pressure. Lay on the Aeris and the Poncho/Votivo. Not so much pressure, drop one of the treatments. “You can change recipes at the touch of a button,” Vodrazka says, noting that one dealer who tested the system taught his 18-year-old daughter how to run it. She ran the system 80% of the time. A man who allows his daughter to run the system also is confident that it’s safe, Vodrazka points out. The closed system improves safety for the operator and decreases environmental risk from spills.